Ammonia robs the water of its oxygen content. The fish in a pond that has too much ammonia will have no choice but to gulp air from the surface. Eventually, they will become comatose and die. It's good to always test your pond water every week for ammonia levels to prevent this from happening. Healthy pond water will have ammonia levels of 1.5 parts per million or (if the test only looks at PH levels) a PH reading between 6.8 and 7.4. The Southern Regional Aquaculture Center recommends that you greatly reduce feeding the fish, as a big source of ammonia comes from fish waste and from uneaten food. Remove any fallen branches, decaying plants or dead fish which can be contributing to making more ammonia. Also, add more oxygen to the fish pond through the use of aerators. 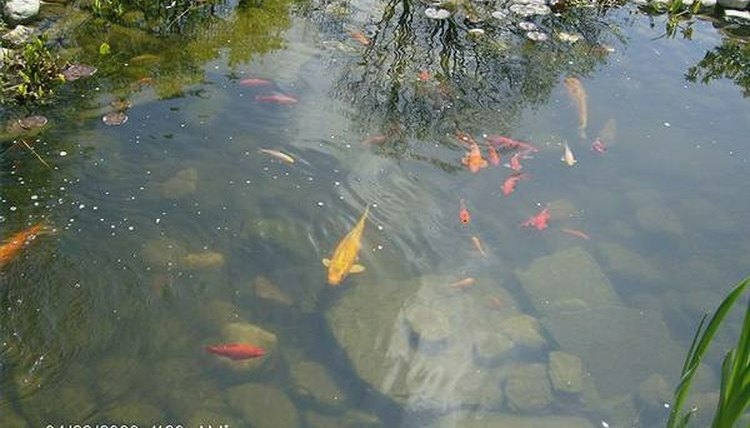 One way to help the pond recover is (if possible) to make your pond deeper so there is less concentration of ammonia in the water. This could be done by removing bottom decaying matter or removing dirt. Only an inch or less of depth is necessary. Koi Clubs USA recommends adding a salt water solution should help absorb ammonia and nitrates. For every ten gallons of water in the pond, add 1 1/4 ounces of salt.